ABSTRACT: This article, which is based on fieldwork carried out within a Residents’ Committee in Beijing, explores the way in which this low-level urban society management authority functions. More precisely, it analyses the relationships established by these administrators with the higher echelons and likewise with the residents and the way in which these relationships develop, depending on the activities in question. It describes in particular how the expectations of the upper echelons, and the way in which they are expressed, orient and limit the practices adopted within these authorities and the operating norms that result. Particular attention is paid to the management by numbers imposed by the upper echelons, and its impact on the functioning of Neighbourhood Communities. KEYWORDS: Residents’ Committee, Subdistrict Office, management by numbers, norms, visibility. 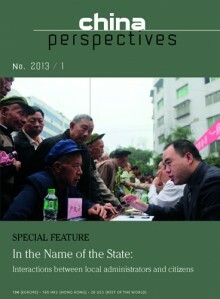 ABSTRACT: Despite the existence of an administration – the chengguan – one of whose main roles is to control illegal street vendors, the latter are still very numerous in Beijing. This paradox can be partly explained by a form of tolerance on the part of the chengguan in response to the public resistance to their actions, which is linked to the conflictive nature of their relationship with the street vendors.This tolerance appears to be erratic, but is actually based on recurrent distinctions made by this administration. However, the informal, revocable, and ultimately unpredictable character of the control exercised by the chengguan has resulted in a continuation of the conflictive nature of their interactions with street vendors. KEYWORDS: chengguan, street vendors, interactions, control techniques, informal practices. ABSTRACT: The aim of this article is to describe the various actors who intervene in the renovation (and therefore relocation) projects that have been proliferating in Chinese cities for several years. The term “relocation” is a translation of the French term “délogement,” which was coined by the author to refer to the specific process that brings together urban renovation, destruction of housing, and displacement of occupants in China today. Based on a field study conducted in Shanghai between 2003 and 2008, this paper intends to reveal the diversity of actors involved in such projects and the varied relationships they maintain with the official sphere, which directly influences the course of negotiations regarding compensation and rehousing. KEYWORDS: Shanghai, urbanisation, renovation, relocation. ABSTRACT: This article is based on a field survey conducted in a village whose lands were expropriated, its homes destroyed, and its inhabitants relocated to two blocks of flats built about a hundred metres from the village, and in which new neighbourhood administrations were set up. Supervision of the evictions by local authorities seems crucial in the process of adapting former villagers to their status as urban dwellers. However, the interactions between cadres and people in their new urban setting cannot be understood without taking into account the resistance that preceded the eviction, a resistance that we will seek to reconstruct. KEYWORDS: conflict, expropriation, population displacement, migration, urbanisation, transition, property. ABSTRACT: This article is based on a survey conducted over two years in Kunming and its vicinity, as well as in the rural areas of Yunnan Province. It considers the relations between administrators (officials) and the administered (families) in the process of adoption procedures. After going over the regular, albeit little noticed, practices of adoption in China, the text analyses the interactions and negotiations that take place, case by case, as families turn towards local authorities in order to legalise the presence of a child they have acquired and taken charge of. The main focus is on the multiple and also contradictory legislative frameworks having a bearing on institutional procedures that, in view of their internal contradictions, widen the margin of manoeuvrability for local officials as well as adoptive families. The two sides thus come up with non-legal norms concerning what is best suited to such situations. KEY WORDS: adoption, law, family planning, family, legal norms, renqing / renxing. ABSTRACT: This article examines the relationships between administrators and the administered within the framework of local development brokerage practices directed at setting up running water systems for domestic consumption in Tibetan rural areas of Qinghai Province. Split between several locations, the activities of the brokers entail finding agreements and compromises in various forms with a variety of interlocutors: local government, the recipients of the project – and also the deities. KEYWORDS: local development brokerage, access to running water, Tibetan Plateau, Qinghai, relations with local government. ABSTRACT: All Hong Kong universities have been actively influencing education in China since 1997. The major methods include: running an independent university in one case, and managing and transforming four colleges in another; training many mainland students in Hong Kong who upon graduation return there; and serving as a home base on the doorstep of the mainland from which academics can influence their colleagues across the border. This paper shows how all these methods transfer a new set of academic norms prevalent in Hong Kong to the mainland. KEYWORDS: international education, returned scholars, overseas students, value transfer. Arif Dirlik, Culture and History in Post-Revolutionary China. The Perspective of Global Modernity, Hong Kong, CUHK Press, 2011, 341 pp.